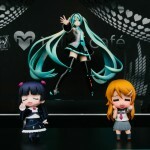 But perhaps it should be no surprise – virtual diva Hatsune Miku is quickly becoming a household name in Japan and making inroads overseas. Bridging the gap between cultures and nations, she’s at the crossroads of technological progress and human expression, facilitating thousands of creators worldwide as the poster child for Vocaloid technology. 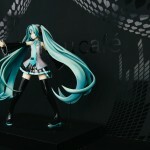 The café itself has a 1/1 Hatsune Miku statue on stage. 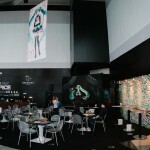 A central listening station with several interconnected tablets showcases Miku’s greatest hits, and a “community wall” has been set-up, where visitors to the café can leave their own personal message for all to see. Several large Vocaloid tapestries fly overhead. The whole space is flanked with large windows stretching from floor to vaulted ceiling, offering great views of Tokyo’s urban canyons from a rather intimate perspective. It’s really an impressive space in its own right. 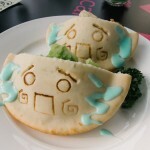 When it comes to concept cafés, food is paramount. 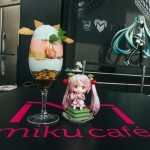 The special café menu offers creative Miku-themed food and drinks at a reasonable price- a step above Akiba’s GSC café, in my opinion. 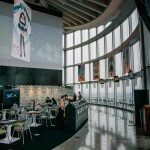 I did, however, see several tourists a bit perplexed at the unusual offerings, like fried rice smothered in green onions, and a leek drink, replete with Miku’s signature vegetable as a garnish. 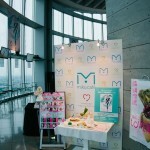 “Miku Café” is on from April 26th to June 16th, and the Mori Art Museum exhibition runs until September 1st, 2013. 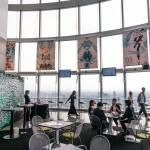 Admission to the observation deck is 1500 yen and includes access to both. 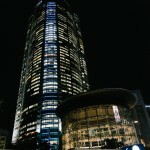 If you’re in Tokyo, definitely check it out!